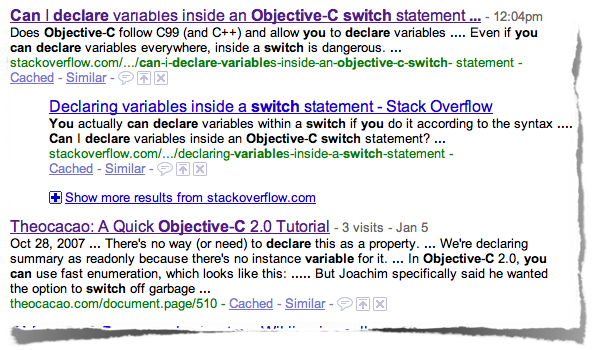 The first result was the same question I was asking, with an answer on Stack Overflow! Stack Overflow went into public beta in September of 2008 (I got the answer for this question by asking “how old is stackoverflow” on Meta Stack Overflow) — that’s not very long ago. What a game changer (not to mention a time saver) Stack Overflow has become. Yep, it’s amazing how knowledgeable and helpful the people on Stack Overflow are. Indeed, stackoverflow is the next big thing. It’s probably the most valuable single source when nothing else could be found on the net. StackOverflow is ‘Expert Exchange’ done right. I use Keynote’s border effect and then use Grab to capture the adorned image. There is also a plugin for Acorn which will do this. I agree. Also interesting that Google gives the best result first, while Bing’s top entry is the generic Wikipedia Objective C page.